OM3 LC LC Duplex Fiber Patch Cables 10G Multimode 50/125 Aqua Jumpers. OM3 LC to LC Fiber Patch Cable 10Gb Multimode 50/125 Duplex jumper cords (10Gb up to 300 meters). Terminated with durable ceramic ferrule LC connectors, this high bandwidth 10Gig multimode cable has Corning optical fiber glass for high speed, low loss, fibre network transmission. A high quality, aqua colored, 2.0mm thick outer diameter, PVC fiber jumper cord with zip-cord. 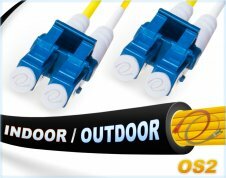 OM3 LC LC Fiber Patch Cable | 10Gb Duplex 50/125 LC/UPC Multimode Jumper Cord. Accelerate your network's performance with this Corning 50/125um core/cladding, OM2 backwards compatible, laser optimized 1/10/40/100Gb multimode fiber cable and extend your 10Gig reach up to 300 meters. Assembled with ofnr riser rated, 2.0mm o.d., aqua pvc jacket that's UV resistant, water resistant, fire retardant and immune to electrical interference. Operating temperature between -20°C and +60°C. 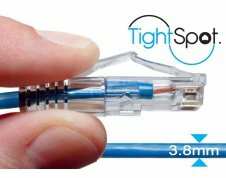 This high quality, commercial grade, OM3 fiber cable comes pre-terminated with small form factor (sff), 1.25mm ceramic ferrule, LC connectors, including pre-installed duplex lc clips. 1Gb up to 550m (1000Base-SX) - Requires mode-conditioning patch cord. Every fiber optic patch cable FiberCablesDirect ships is individually tested in accordance with ANSI/TIA/EIA-455-171-A- 2001 attenuation standards by a qualified fiber optic technician and carefully packaged with test results. We provide 15 popular length options in our online catalogs between 0.5 and 300 meters that can ship the same day. Expedited Next Day, 2 Day, 3 Day, Ground and other delivery options available from USPS and UPS. FedEx service options also available for international orders. We do it right with quality products, lifetime warranty, superior packaging and fast delivery anywhere in the world. Try our Custom Cable Configurator, quickly build your own customized fiber optic cable and add to cart. Select cable type, length, connectors, modality, strand count, jacket type, quantity and add to cart... we build to order. Call in your Custom Cable Request toll free at (866) 933-4237 and our support team will help you determine your perfect fiber cable solution. Call in your order toll free at (866) 933-4237 and we'll process right over the phone. Pay with a Check, Credit Card, or Create an account and pay with a PO#. Call in your quote request toll free at (866) 933-4237 or fill out our Quick Quote form. Not bad but would have been nice to get all my cables the same length. Fiber cable works as expected no issue with quality or performance. Seem to be quality cables. Very well labeled.